The Polar vortex is marked by the blue line which will sweep across Kentucky later today. 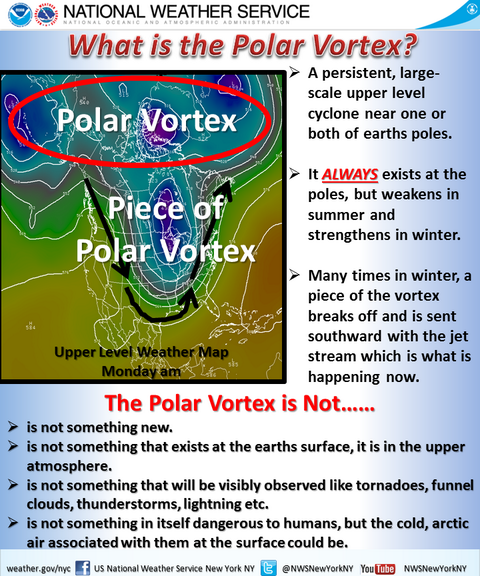 As stated in the graphic, generally a piece breaks off of the main vortex and is dropped south. This is exactly what is happening to us as a piece over Winnipeg broke off. We will continue to see temperatures drop until Thursday. Today we’ll see it get up to 30°. Tomorrow is where the real danger will hit with an expected high of 17­° but with wind chills as low as 10°. There is a wind chill advisory in effect for 4 am tomorrow through 1 pm tomorrow. A wind chill advisory has just been issued for Butler, Edmonson & Warren County from 4a – 1p Wednesday. Barren County schools have decided to close 1/30, 1/31, and 2/1 due to the cold and illnesses according to a Tweet by superintendent Bo Matthews. Right now Warren County is open and not on delay. Keep in mind that this could easily change later on in the evening. With this system we will see some light snow tonight and tomorrow. Neither will result in any major accumulations. It will likely be trace amounts. Thursday will at least give us a high in the mid 30s which, by the time we reach it, will feel like a tropical heatwave! Thankfully it does not look like we will be getting any snow that day either. WARNING: Wind Chills expected to be as low as -10!!! Please stay inside if possible. If not make sure to dress warmly! Also PLEASE bring any outdoor pets inside. If it is cold to you, it is cold to them!! School Closings:Jefferson County Public, Barren County, Hardin County, Warren County, and WKU. The majority are closed. Please stay safe and warm everyone! !